Curators have to make choices: not everything can make it into an exhibit, and there’s seldom enough space to share every interesting fact about the things that are on display. That’s where social media comes in! Here’s a closer look at another “Just Married” story from JMM collections manager and Just Married! curator Joanna Church. To read more “Just Married!” extras, click here. To read more posts from Joanna, click here. The newlyweds settled in Baltimore – living for some time with Rosa’s widowed father, Isaac C. Weiller, at the Marlborough Apartments on Eutaw Place, before moving to their own home in the nearby Esplanade Apartments – and in 1909, Sidney went into business with Rosa’s brother Charles, founding Thanhouser & Weiller, manufacturers of boys’ clothing. 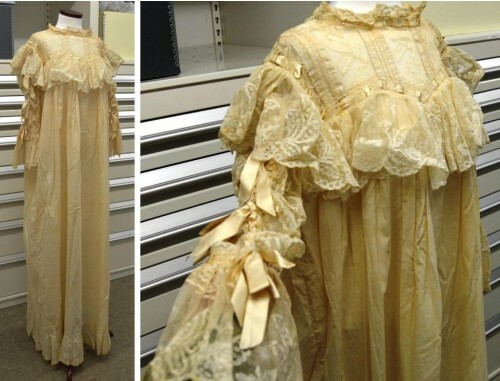 They had two children, including daughter Louise who in 1989 donated her parents’ album of congratulatory wedding telegrams (on display in our “Just Married!” exhibit) and, from her mother’s trousseau, a set of fine lace-trimmed muslin nightclothes. At the time of Rosa’s marriage, a typical bridal trousseau included not only the wedding ensemble itself, but also a going-away outfit (for leaving the ceremony and/or starting off on the wedding trip); the linens necessary for starting her own household; and some pretty underthings. According to Emily Post (1922), the bride’s mother is responsible for buying as many of the latter as possible, for “the various undress garments which are to be worn in her room or at the breakfast table, and for the sole admiration of her husband, are of far greater importance than the dresses and hats to be worn in public.” Though Rosa’s nightclothes are a far cry from the negligees a modern bride might choose, remember that fashions change in many ways – not only for the wedding gowns themselves – and what looks matronly or old-fashioned to us today was quite stylish and sophisticated in 1903. 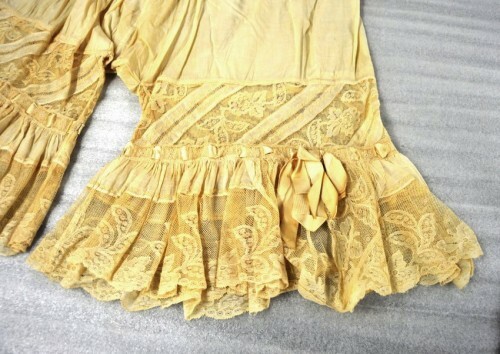 Curious to see what other brides were wearing in 1903? Here’s a full ensemble – including wedding gown, underclothes, shoes, fan, and nightgown (click on “additional images”) – worn by a Brooklyn bride that year, courtesy of the Met. 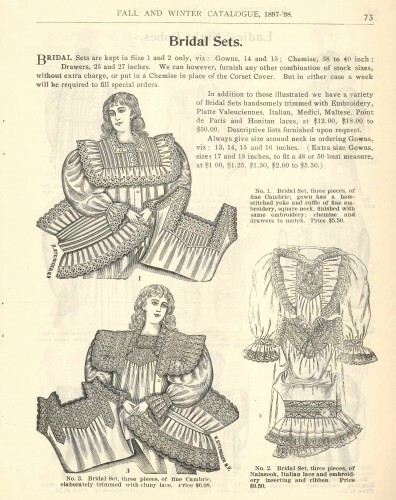 The Chicago Tribune detailed the “Trousseau of the June Bride” for 1903 (though without describing the nighclothes, sadly). And here’s a 1903 description of an appropriate British trousseau (and, in the section above, of a stylish 1903 nightgown very similar to Rosa’s), quoted in C. Willet Cunnington’s fashion history classic, The History of Underclothes (1951).